Definition: A quilt made from the clothing, T-shirts, sweatshirts and any other textile that had been worn or used by a loved one who has passes away. Are you looking for something meaningful to do with the clothing of a deceased loved one? 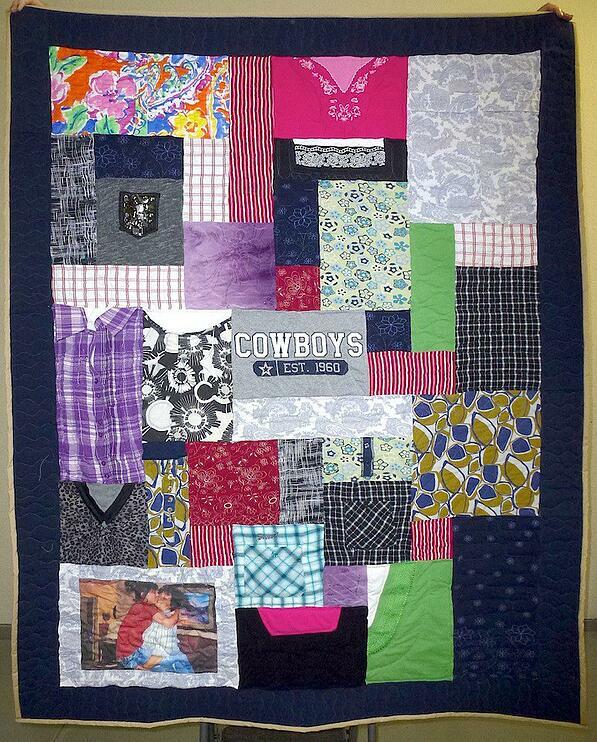 Have you considered having a memorial quilt or pillow made from their clothing? 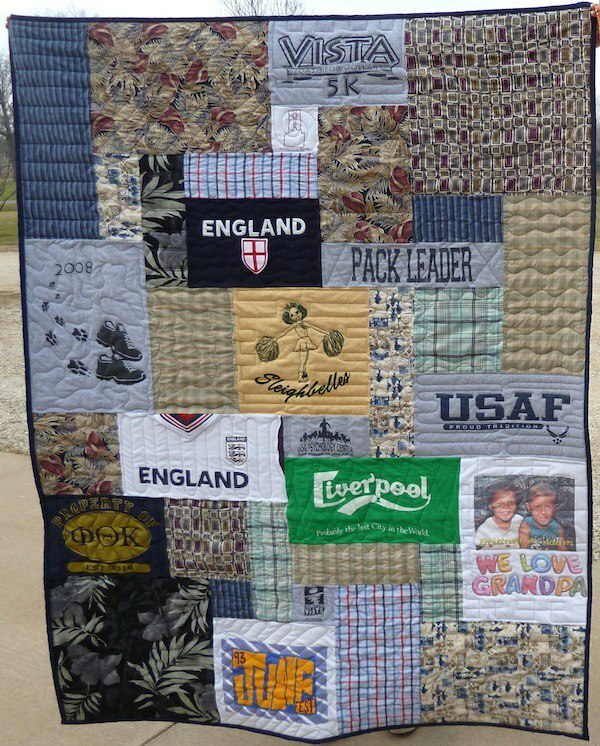 With a memorial-clothing quilt, you can wrap up in their clothing and memory. If you are planning to have a quilt or two made from your deceased loved ones clothing, here are the first steps of that planning process. Begin by deciding who might like a quilt or a pillow. This will be contingent on your budget and how many clothing items you have. Here is a link to the pricing page on our website. This will help you determine your budget. We have found that a typical adult wardrobe can make about 5 to 8 queen-size quilts or many smaller quilts and pillows. Make a list in order of importance of who should receive one. 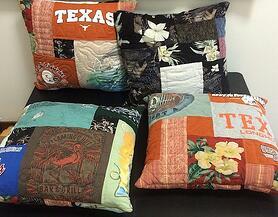 Next, figure out if you need quilts, pillows or a mix of quilts and pillows made. This will depend on how many people may need a piece of the deceased clothing. Here are a few examples. A young parent has died and left two children and a spouse. This would be a great time to have a quilt made for each – so three quilts. If the parents of the deceased are involved, they might like to have a pillow. A grandparent has died and has 8 grandchildren and a spouse. The spouse may like a quilt. A pillow for the grandchildren would be a wonderful way for him or her to remember their grandfather. So one quilt and 8 pillows. A child has died and has left behind parents, grandparents, siblings and friends. Depending on the age and wardrobe of the child, there might not be enough clothing to make something for everyone. We would suggest first making something for the siblings and then the parents. 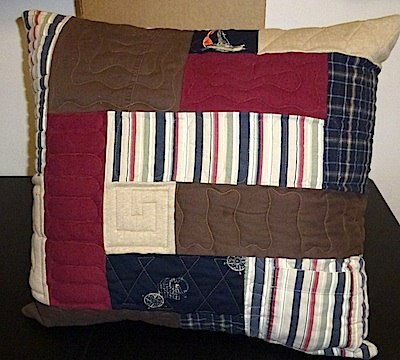 If there is enough to make additional pillows or small quilts, then the grandparents might be next in line. So a small quilt for each sibling, and a larger quilt for the parents. Or a large quilt for the parents and a pillow for each sibling. A baby has passed on. The baby clothing, blankets and bibs could be made for the mother of the child. These are the saddest quilts for us to make. But the impact of the quilt is enormous. Read more about baby clothes quilts here. As you work through the clothing, you need to think about the type of fabrics you choose to put in your quilts and/or pillows. If you choose an item that is dry-clean only, then what you make out of it will have to also be dry-cleaned. 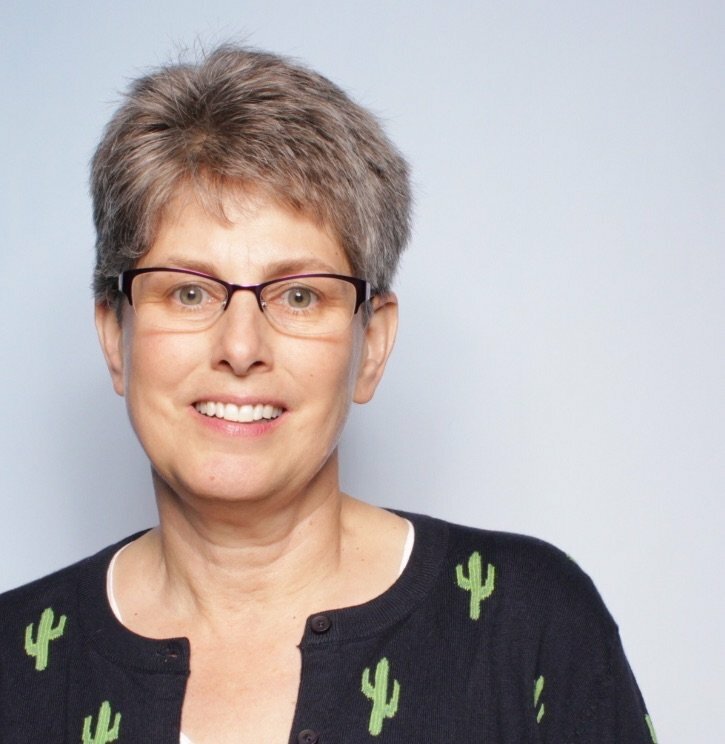 For example, if you put a dry-clean only blouse in a pillow with 5 other items you could wash in a washing machine, the pillow will have to be dry-cleaned. Read the washing instruction label to know. How Many Clothing Items Are Needed for a Quilt? This will depend on how many you have and how many quilts you plan to have made. Typically we will make one quilt block from each item. 30 to 40 items would make an interesting quilt. If you want a small quilt, then we would use a smaller piece from each item. Conversely, if you want a larger quilt, we would use large blocks from each item and perhaps multiple blocks from each article. The larger the quilt you want, the more pieces of clothing you can use. So for a queen or king size quilt, you could choose 60 to 70 articles of clothing. How Many Clothing Items Are Needed for a Pillow? We suggest that you choose 6 coordinating clothing items for a pillow. We cut 4 to 6 blocks from each items. Remember when choosing the clothing for the pillow that you want to choose soft items that feel good to touch or lay your face on. After you have decided on how many quilts and pillows you want to have made, the next step is sorting the clothing out. Click here to read more about tackling sorting out a deceased loved one’s clothing. These quilts are always sad to make, but we know from personal experience that these quilts and pillows can have a positive impact on loved ones as they grieve.